There are several instances where operators participating in lifting and hoisting operations will find themselves working at height. Historically many countries adopted a so called ‘safe’ limit to their approach to reducing the risks in working at height. It used to be 6’ (1.8 m). Anything below this level was considered safe and therefore no special precautions were deemed required. This approach has largely been discredited over the last 20 to 30 years and the majority of countries now follow a risk based approach where all operations conducted above ground level should be properly risk assessed and steps taken to reduce the risk ‘so far as is reasonably practical’. This now means that even operations that are say 20 to 30 cm above ground level could require the provision of a safe working platform. Ladders are an example of a device that may provide safe access when working at heights, for example allowing access for a slinger to locate and sling or unsling a shackle from a hook. Ladders should only be used for short during work, say five to 10 minutes for simple tasks that can be conducted by hand or with simple hand tools only. For longer duration or more complex work (e.g. use of power tools) then a safe working platform should be used. Examples include but are not limited to: tower scaffold, cherry picker, scissor lift, and edge protection fitted around the exposed edge of a facility. When working at height other forms of protection may, through detailed risk assessment, be considered appropriate – here I am thinking about the use of harnesses and lanyards. There are several systems to consider. A fixed anchored lanyard that physically prevents the user from approaching an exposed edge may be helpful in tasks where the operator is working in the same position for long periods of time and does not need to move around. The alternative is an inertia harness protective system – typically these devices will not prevent the person from falling, but they will stop them from hitting the ground (other surface). The inertia reel slows the fall descent and brings the person to a gradual stop before they hit a surface beneath them. There are two key things to consider here. There must be a safe anchoring point to connect the lanyard to. The anchor point must be tested to ensure it fulfils the mass and momentum requirements; the system must be set up to ensure that the lanyard will stop the person before they hit the surface underneath and most importantly there must be a rescue plan as to how to recover a person who has fallen. This is not as easy as it sounds as there are real health issues recovering a person who has been suspended for a period of time and it can be very hazardous for the people working at height trying to recover the person. A study of the safety statistics of the International Oil and Gas Producers (IOGP) identified that lifting and hoisting operations are a significant cause of fatal accidents in the oil and gas industry. Similarly, in other industry categories like construction, marine operations and warehousing, lifting and hoisting operations are a major cause of incidents. When lifting and hoisting, incidents may occur for a variety of reasons. The principal causes include but are not limited to the following. Coming into contact with a moving load will often result in serious or fatal consequences due the masses involved. Examples include staff responsible landing and stacking loads getting caught between a solid surface and the moving load, or loads being moved before all staff have moved clear of the lifting zone and getting crushed by the load. This latter situation can also be exacerbated if a load is picked up and the centre of gravity is off centre, causing the load to start swinging unexpectedly and uncontrollably. The line of fire topic is particularly relevant in marine and offshore locations where the vessel transferring the load is also moving with the sea state. Loads can rise and fall without warning and control. These events also typically result in serious consequences due to the significant masses involved. Lifting equipment can overturn for a variety of reasons. Some common causes involve not using or fully extending the outriggers to provide a solid platform. A further cause is setting up a crane on ‘made up’, or non-compacted/disturbed ground. The ground underneath may ‘look’ solid, but it can be deceptive. As a load is moved and weight transfers over the outriggers, they can start to sink into the soil. Even a small angle shift away from vertical can cause the crane to overturn. The presence of non-compacted ground is particularly common on any construction site, where excavations may have been made for ground works and in any so called ‘brownfield’ site activity. One major factor here that is either overlooked or not understood is that the crane boom/forklift truck does not actually have to come into direct contact with the power line. The electric current can ‘arc’ through the air when an earth point is within a certain distance. The distance that the current can ‘jump’ is determined largely by the voltage, the higher the voltage the greater the jump. Some higher voltage power lines can jump over one metre. Direct contact and/ or or arcing can lead to a powerful electrical discharge to earth which will pass through the lifting device. The significant heat generated can also start a fire. In many cases the operator sitting in the cab may be isolated from the current and will not typically feel anything, but they are at significant risk if they attempt to leave the lifting equipment while the current is still flowing, as once they grab the structure and place a foot on the ground the current may then pass through their body to earth. Not necessarily as frequent as some of the events described previously, but still relevant. Safety devices like a safe working load indicator can fail. Braking systems, hydraulic systems and electrical systems are all vulnerable to failure. 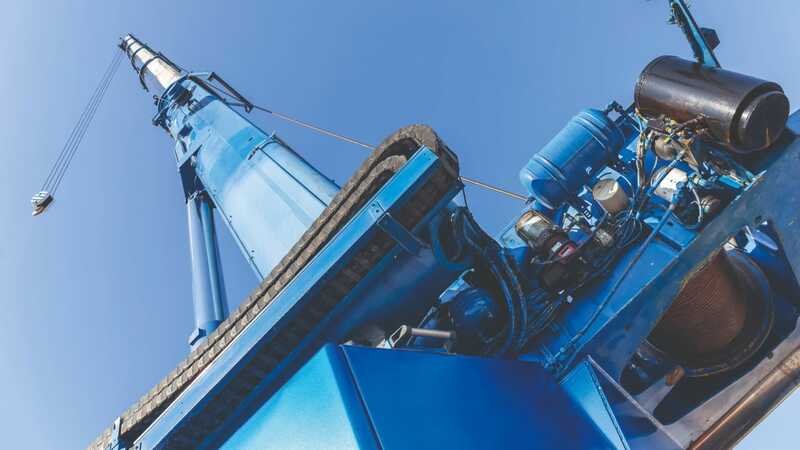 The very nature of the way that lifting devices are typically used, moving between locations, working in a wide variety of environmental conditions all add significantly to the wear and tear on this equipment. The key factor here for prevention is the systematic inspection, testing and certification of lifting and hoisting equipment. Whilst a slightly different mechanism of failure, it is also worth considering the condition and integrity of lifting accessories; slings, shackles and hooks as examples. These devices can also fail with catastrophic results. This hazard can occur in several ways; objects may fall off the crane, the load could fall, parts of the load could fall or items left on the load or hidden within it may fall. To elaborate on this latter topic, whilst it is credible that the entire load could fall (poorly slung or if it is disturbed in transit), what is perhaps more common is for part of the load to fall. This is very common when multiple objects are being slung and moved simultaneously; for example, pipes, bricks, sacks, etc. If the objects are not secured properly it is quite common for items to shift once the load is raised and then can fall to the ground. Regarding the latter topic where items are left on a load by mistake, e.g. hand tools (hammers, screwdrivers, pliers) or items are hidden from view – a common item here is the presence of rocks or other solid materials in pallet pockets) – once the load is airborne these objects may fall off or out and cause injury. A topic that is related to lifting and hoisting and is a significant cause of injury, occurs when riggers/slingers have to climb on top of loads to either attach a sling to a hook or vice versa. Climbing on top of the load (containers, modules) can be problematic as there is no safe access and no fall protection on top. There have been several instances when people have fallen from heights greater than two metres which have resulted in significant injury. This list is by no means exhaustive and I am sure that fellow professionals will have many other examples. The good news is that there are many things that can be done to prevent these incidents from occurring. Let’s take a look at some of these elements. All personnel involved in a lifting operation must be trained and competent to fulfil their duties and responsibilities as part of the lifting team. Basic training can take many forms. In some countries, such as Russia, for example, the training is a government mandated and administered course. Certificates are issued upon successful completion and no person may take part in a lifting operation unless they have the appropriate certification. In many locations, however, there is no such mandated course and thus it is left to the companies involved and/or the individuals to complete an independent training course to be able to demonstrate a minimum level of qualification. There are some organisations / bodies like OPITO (Offshore Petroleum Industry Training Organisation) and the CITB (Construction Industry Training Board) which help to develop training syllabi for a variety of lifting and hoisting roles where the information has been communicated internationally. Whilst OPITO does not by itself provide training, it will certify training providers in a wide variety of countries to conduct and teach their courses. Of course, as we all know, training does not equal competence, so further on the job training, instruction, coaching, mentoring, and evaluation are required before an operator can be truly considered (certified) as competent. Having a trained and competent workforce is a major factor in helping to minimise and eliminate hazards. In conjunction with ensuring that all personnel are trained and competent it is also very important to ensure that you have sufficient people in key roles to manage the lift safely. Lifting teams will vary in size and role depending upon the complexity and type of operation conducted. For a routine forklift truck operation, you may simply have a trained operator; in some more complex situations, you may also have a spotter or guide to assist the operator to move the load and keep other personnel away from the hazard zone. For a typical simple (routine) crane operation there will most likely be a team of three: the crane operator, the banksman, and a slinger/rigger. It is vitally important, even in a simple setup like this that it is very clear who is the nominated PIC (Person in Charge). In the case described previously this would most likely be the banksman. As the complexity of the lift increases additional people will be required. As an example, to assist with moving and landing loads a tag line operator (sometimes two for long loads) will also be required. A supervisor may be brought in to assist in managing a complex lift, as this will free up the banksman to concentrate on conducting the lift. In situations with tandem lifting (two devices simultaneously lifting a load) or for operations with a highly complex centre of gravity requiring an engineered slinging solution, then a qualified lifting and hoisting engineer may be required to design and assist with the definition of the operation. Whatever team is required the three most important elements for the team are communication, communication and communication. This is such a vital component. So many incidents occur because people do not understand the sequence of work, are not informed, or do not understand the key hazards. The lifting team must ensure that there is a detailed lift plan (see below), that roles and responsibilities are clearly understood and that there is a comprehensive toolbox talk (pre-start safety meeting) prior to the commencement of work to ensure everyone involved fully understands how the lift will be conducted. assist with consistency and that once categorised, the actions required under each silo tend to be the same. Another popular scheme is to use low-risk, medium-risk and high-risk to mirror the previous categories. Both are fine and many of the other developed solutions are also fine – this is not an exact science. Every lifting operation requires a lift plan. The level of detail will increase as the hazard and complexity of the lift increase, so let’s look at some items of practicability here. If you run a business where you have five forklift trucks conducting over a 1,000 lifts per day, it is not practicable nor helpful to develop a lift plan for every lift. Therefore, in situations like this it is perfectly acceptable to complete a ‘generic’ lift plan to cover all routine operations. I say routine because the important factor here is that staff recognise when suddenly they are faced with performing an operation that is not normal or routine and that special precautions will be taken in this case. For routine, ‘run of the mill’ operations, however, a generic lift plan is fine. The important issue here is that all operators are familiar with it and do discuss it every day during the pre-start safety talk. Particularly any dynamic changes that may have occurred, e.g. there is strong wind today which may affect stability; there is ice and snow and this may affect traction; there is fog, which may affect visibility etc. So, what type of information should be included in a lift plan? There are some excellent sources of guidance available, usually free of charge to download from the various industry bodies involved. I have not attempted to list and name them all as this would run into the 100s. I have provided a short description of an industry body below that I work with in the oil and gas industry. I am the chairman of the Lifting and Hoisting Task Force of this body and we are about to publish a revised recommended practice document for our industry. That said, 90% of the information in the document is equally useful in any industry.